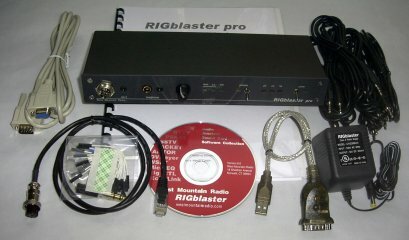 West Mount Radio has a device called the Rigblaster Pro. This device is designed to connect your radio audio, and control lines to and from your computer in a safe and effective way. This device does exactly what it says! When finished, you will have a pretty much hands free operation, you tell the computer to use a sound card mode, and if you are in CW mode, the rig will switch to SSB mode for you, and you begin. The Rigblaster Pro comes with a truly massive set of cables, and is quite intimidating upon unpacking. Fortunately the manual is written clearly and concisely. If you try to second guess the manual you will find that things don’t go well… If you just turn off your brain, and do exactly what the manual tells you to do, it works. I know because I tried to get ahead of things and not read the manual, got lost, and just turned off my brain, removed all cables, and started again. This time it went right together, working the first time I tested it. The biggest problem in the physical install was the sheer number of cables. I use an Icom 756 Pro 3, using Icom CIV to control the rig, so that made things a bit simpler, however the number of cables you will be connecting to your computer and radio are not small. When I initially purchased the Rigblaster Pro, I spent a lot of time looking for a unit which would allow me to never touch it again once installed. I have seen far too many station, where you need to rewire things and change levels every time you change modes. I just want to select SSB, (using my program of choice for digital modes), and be able to do all sound cards modes, or select CW, (again from the computer), and be in CW mode. The Rigblaster Pro looked to be a device which would allow this. By using a number of adapter cables, which are included when you initially buy the Rigblaster Pro, you just plug-in the cable set to the rear of the Rigblaster Pro, and the cables then match your rig. This makes the setup very simple. This met my goal, so I bucked up and spent the $300.00 for it. While the Rigblaster can do sound card CW, it offers the option of just shorting key contacts. I prefer this method, to sound card generation of CW. If you do not use direct CW, your rig will be in USB or LSB mode, NOT CW mode while you are transmitting and receiving CW. This WILL affect your filter choice and/or setups on the rig, forcing you to be in USB/LSB, and not CW mode on the transceiver. By using Direct keying, my 756 Pro 3 is in CW when I am doing CW, and in one of the SSB modes when doing SSB, or Sound card modes. This allows me to have a set of filters preprogrammed for CW. If I used Sound Card CW, I would need to reprogram my SSB filters for CW, every time I switched modes. This device removes all of this, and makes for a hands free experience. The Rigblaster, conditions and isolates the computer data stream, from the rig. You want this, if something goes wrong on your rig, or your computer, you don’t pass the voltage spike on to the other device. This is very important when using a computer and a radio together. There is, in essence, no electrical connection between your rig, and the computer. The Rigblaster, will pass the data from your software, to the radio via this isolated connection. Some devices just wire them together, this can cause all sorts of grounding issues, etc. This is one of the major reasons I purchased the Rigblaster Pro. I don’t like making cables… I like premade, molded cables, with built-in strain relief. Yet another reason I selected the Rigblaster Pro. You tell the West Mountain Radio people, what rig you have, and they include the correct set of cables with the device. That way, I am not running back and forth between the parts store, and home to make sure I have every connector I need. You just plug-in the cable bundle to the Rigblaster Pro, and then the individual cables go to your radio ports. I can use my Heil QuietSet Pro headphones, directly with my setup. I can also route a second audio feed to the speaker, using the Rig output. This allows me to route the mic from the headset, to the Rigblaster, and at the same time, using a different mic input route the computer audio to the radio, without having to change a thing. Going into and out of digital mode, is as simple as it can be. This allows me to directly key the CW key lines. I must have this, as I want to operate my radio in CW mode when I am doing CW. The reason; My Icom 756 Pro 3, has separate filters for each mode, I have my CW filters set up, exactly as I want them. If I had to use SSB mode, I would have a set of very wide filters, or I would have to change them every time I changed modes. I wanted a totally hands free mode change setup. This is one of the major reasons I decided on the Rigblaster Pro. Just icing on the cake, I use a hand controller for PTT, having an input designed for this is just nice… If it were not included with the Rigblaster Pro, I would have still purchased it anyway. The LED indicators are sort of handy, they add more blinky lights, and if something is wrong, it gets noticed. In all honesty, I don’t watch the lights too much. Really handy to have on front panel. West Mountain Radio runs the audio from the computer through this device, and provides an easy way to make level adjustments. Initially it is very handy. As you configure your software, you find you use it less and less, but from the stand point of the first month or so, I used it all the time. If you never adjust your output levels from the software package you use, then you will use this all the time. It is one of the more handy features of the Rigblaster Pro. It should, it is on a different layer than the software, and the software should not even see the device. Completely and totally trouble-free for the past three or four years. Would have been nice to have the screw in connector on the back, but as you can see from the images above, there is no room for it. The install was not too bad. I just did what the manual told me to do. Operation is really easy, I never touch it anymore, it just sits there. I have used it through several years of contesting, so it gets a workout and I am not fussing with it, I am contesting. I almost never use SSB, just CW, so I am constantly switching between digital and CW; I never have to touch anything, I just start the software, select the mode, (digital or CW), and go. This is exactly what I wanted, hands off mode switching, so this device fits the initial purchase criteria perfectly. Would I recommend it to a friend, yes, I would also offer to help him/her set it up though. If you are considering going digital, and you want a hands free operation, you should consider one of these boxes. I almost never touch my radio anymore… I use the computer to tune, transmit, set filters, etc. A lot of this is via the software package I use, but the idea is to never have to touch the rig again… The Rigblaster Pro removes the need for touching the rig by providing a solid platform for connecting the rig and computer together.